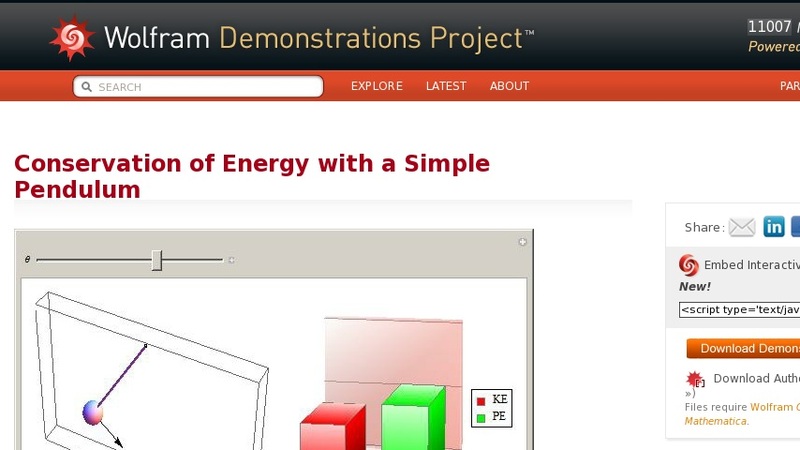 This Demonstration illustrates the principal of conservation of energy using an idealized pendulum (e.g., no frictional losses, no drag). Moving the slider causes the pendulum to move from an initial height with zero initial velocity and maximum potential energy. As the pendulum swings downward, its velocity increases and kinetic energy increases while potential energy decreases. The black arrow represents the velocity vector; its direction, tangent to its path, represents the direction of the velocity vector and its length is scaled to its speed. As illustrated by the bar chart, maximum velocity corresponds with maximum kinetic energy and minimum potential energy.